London Cocktail Week draws to a close on Sunday. No doubt there will be one or two hangovers at the start of next week but in the meantime there is plenty of (responsible!) fun to be had. 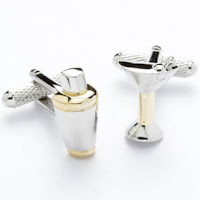 Those who enjoy drinking, or indeed making the odd cocktail or two can add a touch of class to their bartender's uniform with a pair of these Cocktail Glass and Shaker Novelty Cufflinks.